Why is Slope Hard to Teach? By Sybilla Beckmann, Josiah Meigs Distinguished Teaching Professor in the Department of Mathematics at the University of Georgia, and Andrew Izsák, Professor of Mathematics Education in the Department of Mathematics and Science Education at the University of Georgia. One of the challenges of teaching mathematics is understanding and appreciating students’ struggles with material that to the instructor, after years of thinking about it, may seem straight forward. Once we understand an idea, it may seem almost impossible not to understand if it is presented clearly enough. Yet experienced math teachers know that presenting mathematical ideas clearly, as important as that is, is generally not enough for students to learn the ideas well, even for dedicated and determined students. At the same time, students who struggle can have insightful and productive ways of solving problems and reasoning about mathematical ideas. Research into how people think about and learn mathematics reveals why this surprising mix of struggle and competence can coexist: learners can use what they do understand to make sense of new things, yet ideas that are tightly interconnected and readily available for an expert may be fragmented or inchoate for a learner. Consider the ideas surrounding slope and rate of change, which are well known to be difficult for students. To the expert, a slope is a number that expresses a measure of steepness. It connects changes in an independent variable to changes in a dependent variable. This connection is multiplicative and explains why non-vertical lines have equations of the form y = mx + b. But even students who appear to be proficient—because they can calculate a slope and use it to find an equation for a line—may be missing some crucial connections. They might not see slope as a number, but instead think of it as a pair of numbers separated by a slash, basically “rise slash run.” If the “rise” is 3 and the “run” is 2, then even if they know that 3/2 is a number, they may not connect it to the geometry and algebra of the situation. They might not see this number as a measure of steepness, and if asked to describe steepness, might prefer to subtract the “run” from the “rise.” Students might not see the “rise” as 3/2 of the “run” and they might not connect this multiplicative relationship between the “rise” and “run” to the point-slope form of an equation for a line. Mathematics education research is examining the fine-grained details of how students think about ideas surrounding slope. It is investigating how certain ways of representing and drawing attention to ideas can help students extend and connect their ideas. Research-based instruction can then take into account known challenges and opportunities for learning. We thought readers of this blog might be interested to learn a little about approaches to slope and linear equations that we are currently investigating. Proportional relationships—pairs of values in a fixed ratio—provide an entry point into the study of linear functions and are a focus in the Common Core State Standards for Mathematics at grades 6 and 7 (see  and ). So consider the proportional relationship consisting of all pairs of quantities of peach and grape juice that are mixed in a fixed 3 to 2 ratio to make a punch. When graphed, these points lie on a line. 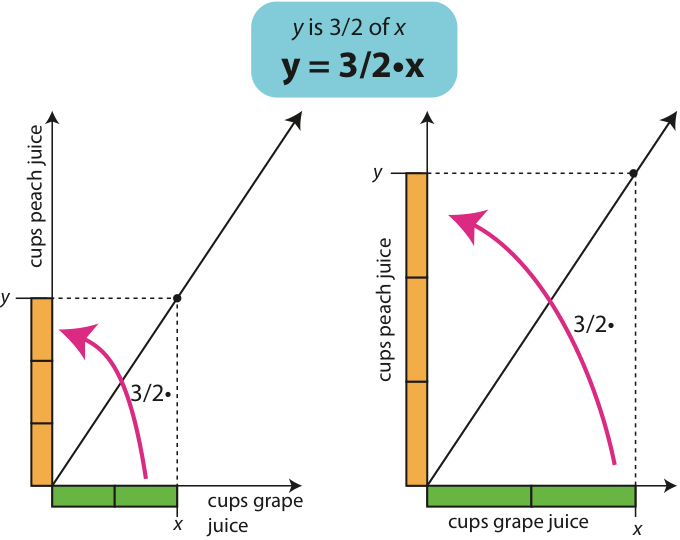 One way to think about the slope, 3/2, of this line is that for every new cup of grape juice, the amount of peach juice increases by 3/2 cups. This way of thinking is part of what we call a multiple batches view, a view that has received significant attention in mathematics education research. From this perspective, we may think of 1 cup grape juice and 3/2 cups peach juice (or 2 cups grape juice and 3 cups peach juice) as forming a fixed batch of punch, and we vary the number of batches to produce different amounts in the same ratio. This fits with the image in Figure 1a, which evokes repeatedly moving to the right 1 unit and up 3/2 units. But as indicated in Figure 1b, the general multiplicative relationship, y = (3/2) x, is less evident, especially for x values that are not whole numbers. Figure 1: Slope from a multiple-batches perspective. Another way to think about the punch mixtures in a fixed 3 to 2 ratio uses what we call a variable parts perspective. This perspective has been overlooked by mathematics education research, but we are currently studying how future teachers reason with it. In a variable-parts approach, for any point on the “punch line” (see Figure 2), there are 3 parts for the y-coordinate and 2 parts for the x-coordinate, and all the parts are the same size. From this perspective, we vary the size of the parts to produce different amounts in the same ratio. The parts expand or contract depending on the direction the point moves along the line. 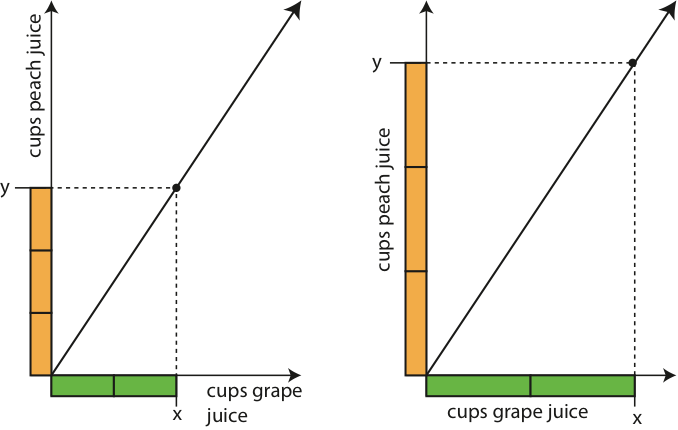 In a variable-parts approach, the slope 3/2 is a direct multiplicative comparison between the numbers of parts of grape and peach juice: The number of parts peach juice is 3/2 the number of parts grape juice. Put another way, the value 3/2 is the factor that multiplies the number of parts of grape juice to produce the number of parts of peach juice, regardless of amounts of juice in each part. Therefore the y-coordinate is 3/2 of the x-coordinate, so y = (3/2) x. Figure 2: A proportional relationship viewed from a variable-parts perspective. 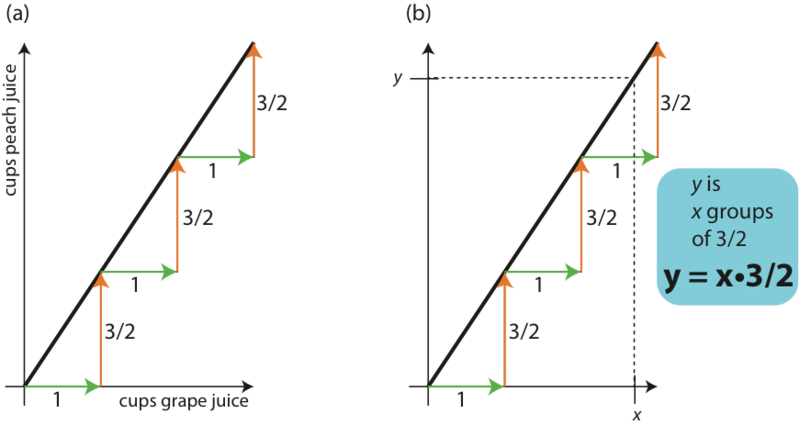 Figure 3: Slope and equations from a variable-parts perspective. We don’t think there is any way to make the concept of slope easy for students. But we suspect that working with both the multiple-batches and the variable-parts perspectives should help students develop a more robust understanding of slope. In particular, the variable-parts perspective might help students connect the slope of a line and an equation for the line. References  and  discuss the multiple-batches and variable-parts perspectives in greater detail. We are currently conducting detailed studies of how students in our courses for future teachers reason from both the multiple-batches and the variable-parts perspectives on proportional relationships*. Discoveries about how future teachers reason about the interconnected ideas of multiplication, division, fractions, ratio, and proportional relationships, and what is easier and what is harder to learn, will help us identify productive targets for instruction in courses for future teachers. But we also hope that others will try the variable-parts perspective with other groups of students. For example, we could imagine a group of college algebra instructors collaboratively designing lessons that use a variable-parts perspective to help students better understand slope and its connection to equations for lines. We also think that the variable-parts perspective is potentially productive for trigonometric ratios. From a variable-parts perspective, we can think of the radius of a circle as 1 part of variable size, r. For a fixed angle, its radian measure, sine, cosine, and tangent can all be viewed as a fixed number of parts (although this number is often irrational). With this perspective, equations such as x = cos(θ)r and y = sin(θ)r arise from the very same reasoning that connects slope to the equation of a line. We think that there are many useful findings of mathematics education research that could help improve mathematics teaching and learning, but that environments and cultures are often not conducive to using the knowledge that we have. We need professional environments and cultures that foster serious discussions about what to teach and how to teach it, where knowledge about teaching and learning mathematics is intertwined with the practice of mathematics teaching, and where knowledge and practice grow together. We applaud the editors and the AMS for starting this blog as a way to nurture and develop such a culture. [*] We are grateful to the University of Georgia, the Spencer Foundation, and the National Science Foundation, award number 1420307, for supporting our research. Beckmann, S., & Izsák, A. (in press). Two perspectives on proportional relationships: Extending complementary origins of multiplication in terms of quantities. Journal for Research in Mathematics Education. This entry was posted in Classroom Practices and tagged college algebra, linear function, middle school, slope. Bookmark the permalink. 4 Responses to Why is Slope Hard to Teach? 1) I think it can be a mistake to explain what appears to be a simple “concrete” concept without building on more abstract and general concepts. 2) Let me start with algebra. Students first learn about variables like x and y as unknown numbers that are assumed to satisfy one or more equations for which they are expected to find solutions. So the idea is that they represent numbers that are required to satisfy certain specified constraints. However, when we switch to formulas and graphs, then these variables suddenly become “free” variables, one called an “independent variable” and the other a “dependent variable” (I certainly did not understand these terms when I first saw them, so I don’t see why less mathematically inclined students should.). This is a huge change in the meaning of the letters x and y, and many students are justifiably confused by this. Suddenly, formulas and equations serve a different purpose than before. 3) Students usually don’t learn mathematical grammar properly, so they view the words “equation” and “formula” as being synonymous. It is important to discuss explicitly the rules of mathematical grammar. 4) Now let me focus on the specific topic here. The discussion is about the slope of the graph of a linear equation. However, since we want to view x as the independent variable and y as the dependent variable, the word “equation” is not really right. We’re really talking about the graph of a linear function but we avoid the word “function” because we supposedly haven’t taught this yet. So there are three rather abstract concepts being combined in this single “simple” concept: function, graph, linear, and slope. I maintain that if you explain each of these concepts carefully and separately, then it’s a lot easier to understand what slope is. And you get the definition of a derivative for free along the way. 5) So here goes. By the way, I tested this on my family during dinner a while back. I didn’t give them any homework or tests, so I don’t know how well they understood it. But they did seem to like it. First, you define “function” to be a “box” or “machine” that accepts a single number as an input and responds with a single number as an output. It’s a consistently behaving machine in the sense that if you feed the same number at different times, it always spits out the same output. A convenient way to describe the “box” is to give a formula that describes how to calculate the output from the input. Second, you define the “sensitivity” of the function to be how sensitive the output is to changes in the input. In other words, if you start with a specific input and start changing it a little bit, how much does the output change? If the output changes a lot, then we say that the function is very sensitive to small changes in the input. If the output changes only a little, we say that the function is not so sensitive. If the output doesn’t change at all, we can say that the function is completely insensitive. But we want to find a quantitative measure of sensitivity. A natural thing to do is to the measure the ratio of the change in output over the change in input. Third, it’s pretty clear that the sensitivity of the function might be different, depending on which input you start with. So what are the simplest cases? First, there is the function where the output is always the same, no matter what input you feed it. That’s what we call a “constant function”. Second, there is the function whose sensitivity is the same, no matter what the input is. That’s what we call a “linear function”. Fourth, now it’s easy to define what the graph of a function is. You’re just drawing graphically what the output is for each possible input. We note that how much and which way the graph is tilted corresponds to the sensitivity of the function. There it is, the slope. It’s the sensitivity of a linear function to changes in the input. Now “rise over run” makes complete sense, because the “run” is how much you change the input and “rise” is how much the output changed in response. I haven’t tested scientifically how effective the explanation above is, but I am convinced that it is much better than what I see in standard textbooks. I also want to thank the Harvard Calculus Consortium for showing me such a down-to-earth approaches to teaching mathematical abstraction. Deane…I agree with you, especially with drawing a box. I am an engineer by training and often sketch a box to mimic a physical system when teaching linear or non-leaner equations. However, I do think we start teaching kids math from day one by underestimating their ability to grasp abstract concepts. We are forever looking for some trick or shortcut to get the concept across. I feel that we are handicapping them as they move into more difficult math courses in elementary, middle school, high school, college, etc. Different people learn in different ways and have different skill areas (and might even learn different things best in different ways — for directions I might do better with a map and written instruction for a recipe). What I would look to do is have a series of pretty simple tasks that help to ‘sort’ people into different ways of learning the material and then dynamically present or PROMPT for the rest of the material. Some kids might do better with physically manipulating an object and others watching it on the computer. Learning on the computer doesn’t work for everyone. Animation is going to help a lot of people where static images and words fail. You gotta hit all the buttons and let kids who ‘get it’ skip through quickly. No Kid Left Behind should mean we work with everyone to achieve to the best of their ability and we celebrate their strength areas. Not every kid is going to be a math wiz – and the math wiz kids should be allowed to excel in that area. If they are ready for calculus at age 10 they shouldn’t have to keep doing multiplication tables << THAT is a huge problem for kids. In practice it is almost "No Kid Allowed To Excel" — it's SO COMPLETELY BORING for kids who get it already and honestly even worse for the kids who don't. You are just torturing them with the same material year after year after year. Make sure they can balance a checkbook and make change and LET THEM MOVE ON — but challenge & reward kids who want to go further into any given area. Maybe carpentry is a better way for some kids to "get" slopes? Maybe dress making is? Let them build and build and build — challenge them to build more complex things so they HAVE to work it out for themselves to get the angles & lengths right. If we treated education as an investment in our future we might be able to afford it. I feel our job as teachers is not to just teach slope but to make connections to concepts that will help the kids store and build a logical framework. The variable parts perspective and exploration into meaning of the numbers 3, 2, and 3/2 in the slope used above is a step in the right direction. I have my students design roof lines for passive solar housing projects, this can go as deep or surface as you please and it helps connect slope with steepness and practical design issues like snow load and sun angle through the year. And it’s fun and engaging to design/plan something meaningful. That’s what math should be about. If we can meaningfully teach more topics students at different levels may find more inspiration and connections that stimulate their creativity and curiosity then we did in junior high and high school. One practical dilemma is the time it takes to develop more connected meaningful concepts and the time we have to fit the complete content of a class into their brains.